Some 2,000 people have migrated from the regime-held village of Tadef near the northern Syrian city of al-Bab to areas controlled by Syrian opposition groups. The Assad regime forces took control of Tadef, after the terrorist organization Daesh withdrew from the village, which is located south of al-Bab. 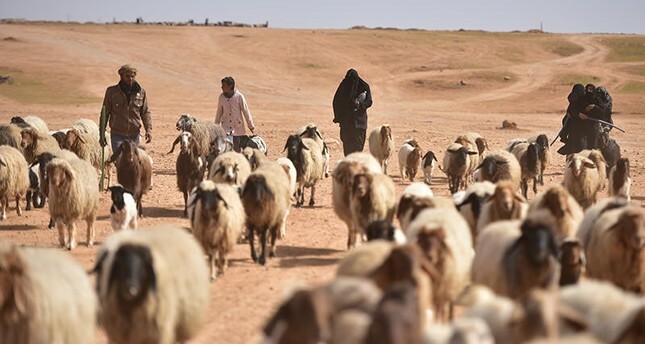 The people, mostly comprised of children and women, had been living under severe conditions and fled to areas controlled by Free Syrian Army (FSA) forces with only their animals and some tents. FSA units are currently trying to provide food to the families. Ibrahim Said, one of the residents of Tadef, said the people fled to safe areas that were controlled by the FSA, fearing regime power in the village. "Daesh left Tadef to the Assad regime without fighting. There is an agreement between Assad and Daesh," Said claimed. The civil war in Syria started in 2011 when the Assad regime cracked down on pro-democracy protests that began as part of the Arab Spring uprisings, with unexpected brutality and disproportionate force. More than 600,000 people have been killed and some six million people displaced since the start of the conflict. Turkey launched Operation Euphrates Shield on Aug. 24, 2016, declaring that it was exercising its right to self-defense codified under U.N. Charter Article 51. A National Security Council press release stated that the operation's objectives were to maintain border security and drive Daesh terrorists away from the Turkish-Syrian border. The operation, which began last summer, relies heavily on FSA fighters backed by Turkish artillery and air support. Since the beginning of the operation, Turkish forces and the FSA have cleared some of the main Daesh strongholds, including Dabiq, Jarablus and al-Bab, and they are likely to continue by clearing Manbij and Afrin of Democratic Union Party (PYD) terrorists, the PKK's Syrian offshoot.